Canvased by a stunning print, this BY JOHNNY mini skirt is the perfect statement skirt for this summer. 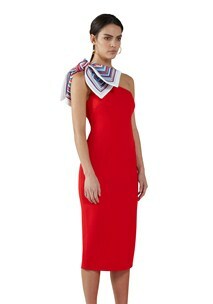 Sitting high on the waist, the skirt falls effortlessly off the hips and waist due to the unique handkerchief cut style. The beautiful floral print is contrasted with the bold red strip which boarders the skirts hemline. 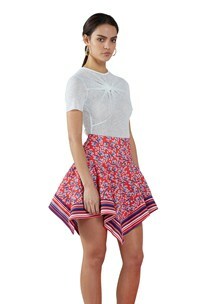 The Chilli Blossom Scarf Mini Skirt is made from bubble crepe and includes a bonded strip hem. The Mini has a centre back zipper and is lined for added comfort.